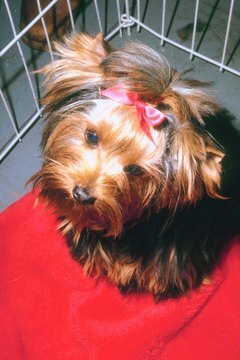 Purebred Yorkshire terriers are popular pets all over the world. Even if you’re not grooming your Yorkie for a dog show, ensuring she has a full coat of hair is important for her comfort and overall health. There are several factors that can impact hair growth in Yorkies, including age, disease, poor grooming and an unhealthy diet. Hair loss or a lack of hair growth can be symptoms of a more serious problem requiring a visit to the veterinarian, but there are many things you can do to increase the health of your Yorkie's coat. Feed your Yorkie a diet high in nutrients and protein. Choose a food that is developed for small dogs and has a high amount of essential fatty acids. Fatty acids like omega-6 help keep the skin oily and healthy for ideal hair growth. For a small dog like a Yorkie, you can also mix a teaspoon of vegetable oil with her regular dry food to promote a healthy coat if commercially available dog foods are not giving you the results you want. Bathe your Yorkie on a regular basis, using warm water and a proper dog shampoo. Work the shampoo into the hair in slow, circular movements while gently massaging her skin to stimulate the hair follicles. Brush her hair using a dog grooming brush at least every other day. Gently pass the brush through her hair several times from front to back and along her legs. This not only removes knots and tangles, but it also removes the dead hair and further stimulates the follicles to grow healthy hair. Bring your Yorkie to a licensed veterinarian if none of the above works, or if you notice a rapid loss or thinning of hair. The vet will be able to determine if the problem is hormonal, viral, parasitic, or simply due to age or some other factor. He may be able to recommend medications or food supplements to further encourage the development of a healthy coat. Do not delay in visiting a veterinarian if you notice that your Yorkie is either not growing new hair or losing an excessive amount despite proper grooming and nutrition. Randy Nicholas has been writing professionally since 2002. He started by writing and editing technical and training manuals, developing educational curricula, and designing corporate policies, plans, and processes. His more creative work has been featured in "The Danforth Review," and "Inscribed: A Magazine for Writers." Do Guinea Pigs Get Hairballs?